Visual qualities were the most important elements in the description of gemstones as well as in the description of their imitations in several crafts, such as oil painting and glass-making in the medieval and early modern period. In this lecture Sven Dupré shows that these descriptions offered a vocabulary to those approaching the question of celestial matter. One of the protagonists of the lecture is Galileo. Situated between the furnaces of the glassmakers on the island of Murano near Venice and the ‘alchemical laboratories’ at the Medici court, Galileo’s connections to the worlds and cultures of glass are multi-dimensional. Of course, the Italian astronomer needed high-quality glass to make his lenses and telescopes. But glass was also central to shaping his artistic tastes and in directing his decisions in questions of astronomy and natural philosophy. 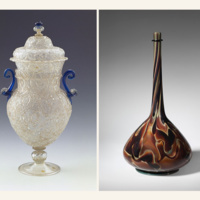 In addressing problems of celestial matter, Galileo elaborated notions of light connecting Northern art and Venetian glass, equally popular in the artistic climate of the Medici court. However, at the same time in which glass changed the way in which we see the world, Anselm De Boodt, physician at the court in Prague, who had direct access to Rudolf II’s Kunstkammer and gardens, replaced vision by touch as the sense most important to the classification of stones. Sven Dupré is Professor and Chair of History of Art, Science and Technology at Utrecht University (History & Art History), and Professor of History of Art, Science and Technology at the University of Amsterdam (Conservation & Restoration). Dr. Dupré’s research is at the crossroads of art history and the history of science and technology and is actively involved in research in technical art history at the Ateliergebouw, where the Rijksmuseum, the Cultural Heritage Agency of the Netherlands and the University of Amsterdam combine their knowledge in the field of restoration and preservation of art objects.